Displays a list of items that the user can select and invoke. B_SINGLE_SELECTION_LIST Can select only one item in the list at a time. This is the default. B_MULTIPLE_SELECTION_LIST Can select any number of items by holding down Option for a discontinuous selection, or Shift for a contiguous selection. Click on an item to select it and double-click an item to invoke it. The BListView doesn't define what it means to "invoke" an item. See BListView::SetSelectionMessage() and BListView::SetInvocationMessage() to set a message to be set when these actions occur. You can also select and invoke items with keyboard keys such as the up and down arrow keys, Page Up and Page Down and the Enter key or Space key to invoke the item. This class is based on the BList class from the Support Kit and many of the methods it uses behave similarly. Although a BListView is scrollable, it doesn't provide scroll bars by itself. You should add the BListView as a child of a BScrollView to make it scrollable. BScrollView for more information on scrolling views. BList in the Support Kit. Creates a new list view. This is the non-layout constructor. Creates a new list view suitable as part of a layout with the specified name, type, and flags. Creates a new list view suitable as part of a layout. Creates a BListView object from the archive message. Delete the BListView object and free the memory used by it. Add an item to the list view at the specified index. item The list item to add. index The index of where to add the list item, if not specified the item is added to the end. true if the list item was added, false otherwise. Add a list of list items to the end of the list view. list The list of list items to add. true if the list was added, false otherwise. Add a list of list items to the list view at the specified index. index The index of where to add the list, if not specified the list is added to the end. Hook method called once all views are attached to the view. Hook method called once all views are detached from the view. Archive the BListView object to a message. Hook method called when the list view is added to the view hierarchy. Returns the number of items contained in the list view. If the index of the selected item is lower than index the value returned is negative, if the index of the selected item is greater than index the value returned is positive. If the index of the selected item is equal to index then 0 is returned. Deselect the item at index. index The index of the item to deselect. Deselect all items except the items with index in the range of exceptFrom to exceptTo. exceptFrom The index of the start of the exception list. exceptTo The index of the end of the exception list. Hook method that is called when the list view is removed from the view hierarchy. Calls the specified function on each item in the list. The func is called on the items in order starting with the item at index 0 and ending at the last item in the list. This method stops calling the func once it returns true or the end of the list is reached. The first argument of func is a pointer to the list item. The first argument of func is a pointer to the list item, arg is passed in as the second argument. B_MOVE_OP: Move the item in data. B_SWAP_OP: Swap the items in data. You should not have to call this method directly, use Invalidate() instead. Returns a pointer to the first list item. Hook method called when the list view is moved. Hook method called when the list view is resized. Returns the index of the item at the specified point. point The location of the list item to get the index of. The index of the list item at the specified point. Returns the index of the specified item. item The list item to get the index of. The index of the specified item. Hook method called when a drag and drop operation is initiated. This method is used by derived classes to implement drag and drop. This method is called by the MouseDown() method. If the derived class initiates the drag & drop operation you should return true, otherwise return false. By default this method returns false. point Where the drag & drop operation started. wasSelected Indicates whether or not the item was selected. true if a drag & drop operation was initiated, false otherwise. Create a new BListView object from the message archive. A newly created BView object or NULL if the message doesn't contain an archived BView. Draws the list item at the specified index. index The index of the list item to draw. Returns the what parameter of the current invocation method. The what parameter of the currently set invocation method. Returns the message that is send when an item is invoked. The current invocation method as a BMessage. Invoke the list view, either with the current invocation message or message if it is specified. message The message to send or NULL to send the current invocation message. Returns whether or not the list view is empty. true if the list view is empty, false otherwise. Returns whether or not the item at index is selected. true if the item was selected, false otherwise. 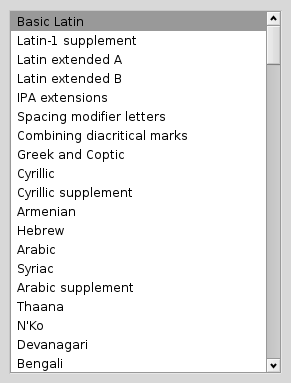 The list item at the specified index. Return the frame of the item at the specified index. index The index of the item to get the frame of. The frame of the item at index. Returns a pointer to the list of list items. a pointer to the list of list items. Page Up Selects the item one view height above the current item. Page Down Selects the item one view height below the current item. End Select the last item in the list. Enter and Spacebar Invokes the currently selected item. bytes The bytes representing the keys pushed down. numBytes The size of bytes. Returns a pointer to the last list item. Returns the current list view type. Empties the list view of all items. Returns the maximum size of the list view. The maximum size of the list view as a BSize. Hook method called when a message is received by the list view. Returns the minimum size of the list view. The minimum size of the list view as a BSize. By default this method selects items on a single click, and invokes them on a double click. This method calls InitiateDrag() to allow derived classes the opportunity to drag and drop items from the list. point The point where the mouse button was pushed down. Hook method that is called whenever the mouse cursor enters, exits or moves inside the list view. where The point where the mouse cursor has moved to. code A code which indicating if the mouse entered or exited the view. dragMessage A message containing drag and drop information. where The location that the mouse button was released. Move the item at index from to the position in the list at index to. from The index of the item to move. to The index to move the item to. true if the item was moved, false otherwise. Returns the preferred size of the list view. The preferred size of the list view as a BSize. Remove the specified list item. item The list item to remove. Remove the item at index from the list. index The index of the item to remove. Removes the items from index and the next count items. index The location to start removing items from. count The number of items past index to remove. return true if the items were removed, false otherwise. Replace the item at index index with item. index The index of the item to replace. item The item to replace the item at index with. true if the item was replaced, false otherwise. Scroll the view to the specified point. point The location to scroll the list view to. Scrolls to selected list item. Selects the list item at the specified index. index The index of the item to select. extend Whether or not to also select child items. Select items from start to finish. start The index of the item to start the selection. finish The index of the item to end the selection. Hook method that is called when the selection changes. This method should be implemented by derived classes, the default implementation does nothing. Returns the what parameter of the message that is send when an item is selected. The what parameter of the current selection message. Returns the message that is send when an item is selected. The current selection message as a BMessage. Sets the font of the list view to font with the font parameters set by mask. font The font to set the list view to. mask A mask indicating which properties of font to set. Sets the message that the list view sends when an item is invoked. message The invocation message to set. Sets the list view type. type The list view type to set. Sets the message that the list view sends when a new item is selected. message The selection message to set. Sort the items according the the passed in cmp function. cmp The compare function to use to sort the items. Swap item a with item b.
a The index of the first item to swap. b The index of the second item to swap. true if the items were swapped, false otherwise. Hook method called when the list view is attached to a BScrollView. view The BScrollView the list view is attached to.